Craft challenges can be a lot of fun. In my case, I was challenged to use these two little parrots. To beat the January blues I thought a bright, whimsical project would be the perfect way to add a bit of HELLO to a dreary corner. Yellow baker’s twine was just the thing. It’s sturdy enough for a light pull and easy to work with, too. 1. 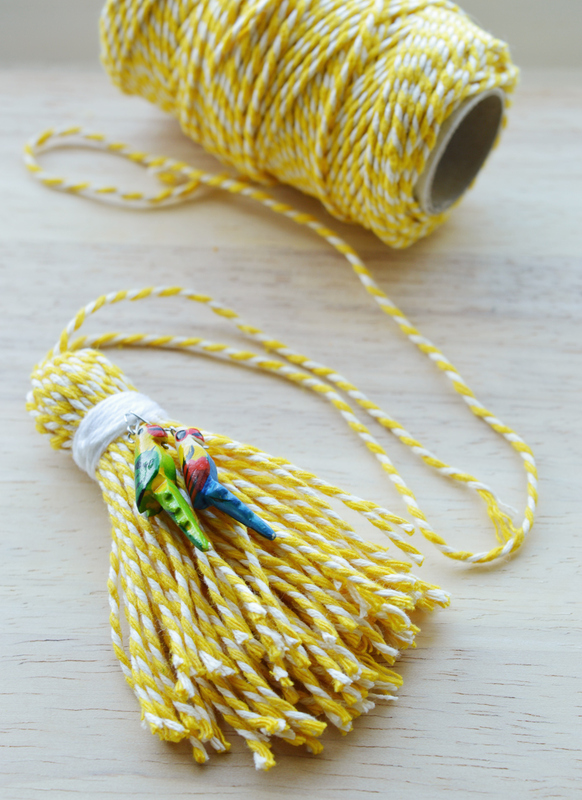 Wrap your yarn around a stiff surface that is about twice the length you want your tassel to be. 2. 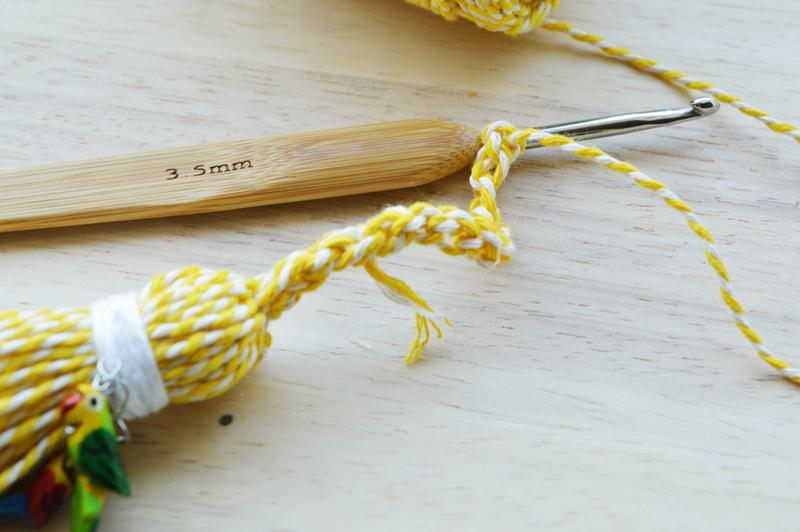 After wrapping, gently remove the stiff base and tie the middle of the yarn securely. 3. Snip the loops of wrapped yarn open. Don’t worry about trimming it neatly just yet. 4. 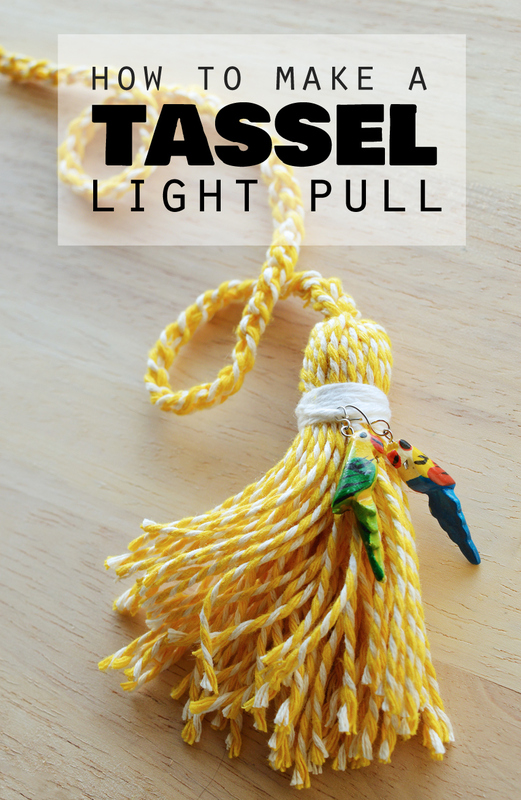 Think of Cousin Itt from the Addams Family and shape your tassel. 5. 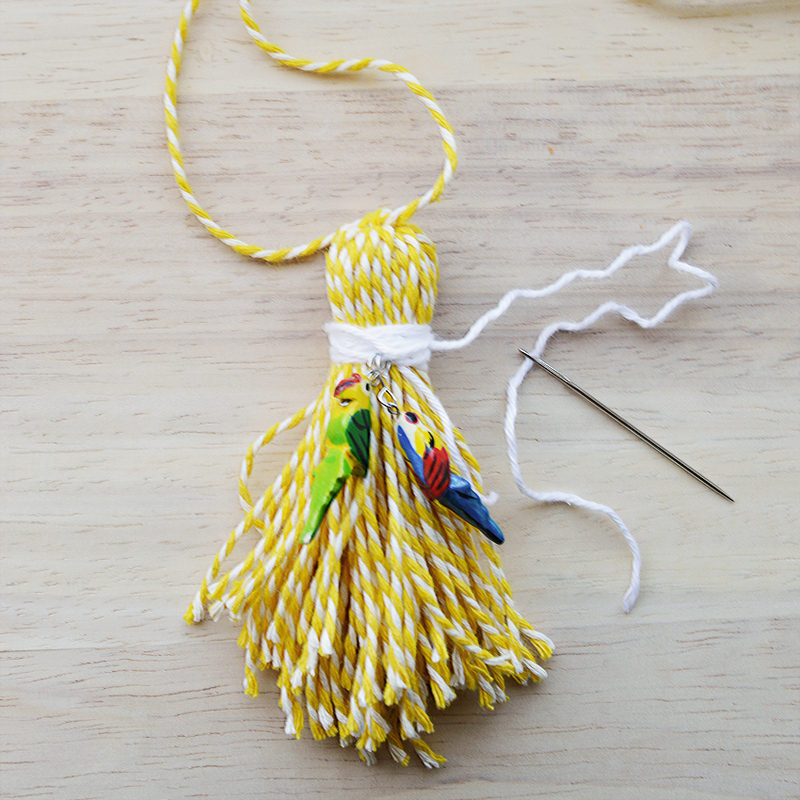 Wrap a piece of yarn a few times to create the ‘neck’. 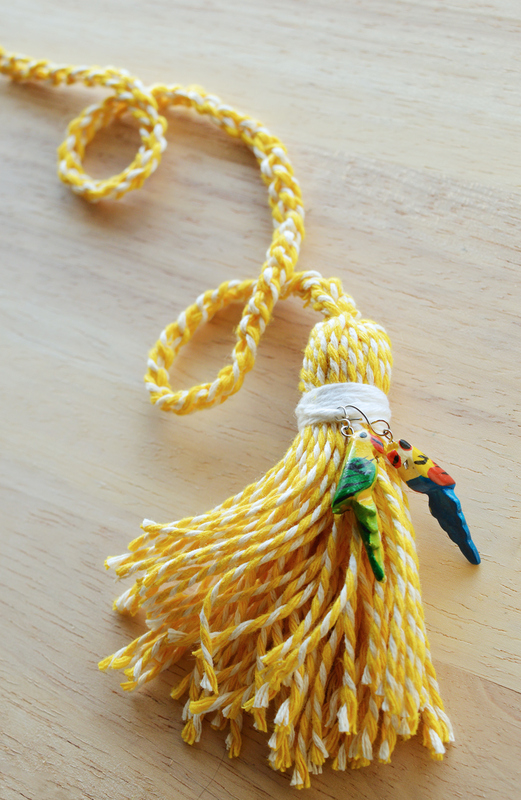 Trim the tassel body if necessary. Done! I used a simple double knot and left a 4″ tail. It looks a bit like a moustache at this point! Secure the neck thread by sewing it through the tightest part of the neck and trim the excess. Grab both the tail and the working twine and pull through. This is the first chain. Just keep looping both the tail and the working thread until the tail is too short. Here you can see the tail poking through! I trimmed that off at this point. 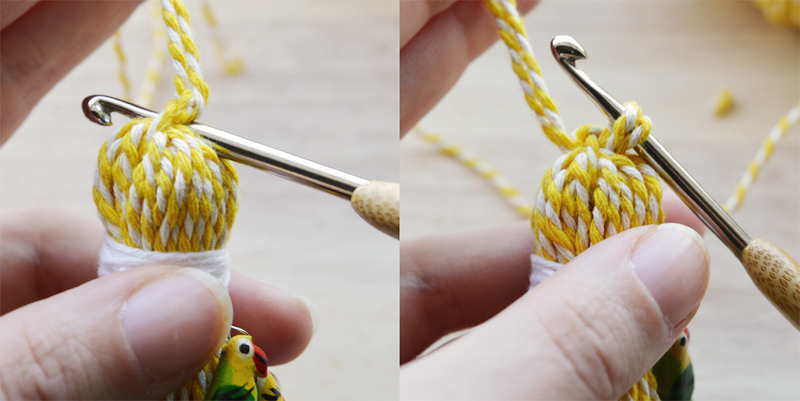 Crochet your chain to the desired length, and tie off the end. I left a long tail so it’ll be easy to secure to a light fixture. It’s always easier to trim excess later than realise you needed it! Enjoy! What corner of your home could do with a bit of whimsy? 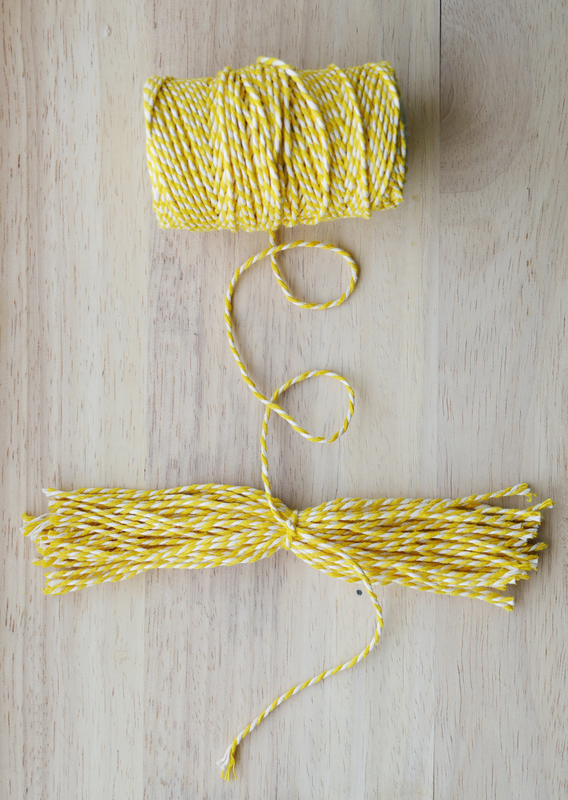 If you love the look of this yellow baker’s twine as much as I do it’s for sale here from The Homemakery. What a jolly make! I love to crochet with bakers twine. Thanks Claire! It’s such a fantastic material to work with. The dual colours means the results are always so cheerful!